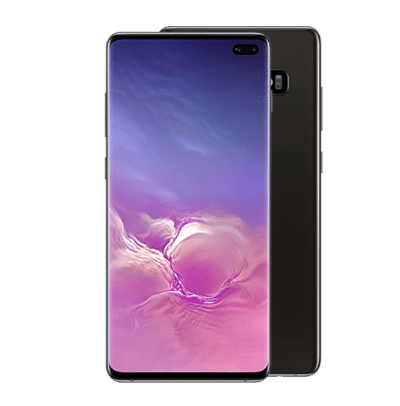 Compare deals on the Samsung Galaxy S10 Plus with Tiger Mobiles. The biggest and best flagship from Samsung is packed full of awesome features. There’s a huge, amazing display, there’s loads of speed and power, there’s a triple lens camera, and much, much more besides. Could this be the phone that you’ve been waiting for? Just check out our great deals on the Samsung Galaxy S10 Plus below. The latest releases from the Samsung Galaxy S line regularly top bestselling mobile lists. And in 2019, Samsung have opted for three iterations of their flagship S10 model. The Galaxy S10 Plus is the largest of these, a true phablet, and it’s packed full of incredible specs. If you’ve already got the S9 Plus you might be on the fence about an upgrade, but the S10 Plus is quite simply one of the best phones that we’ve ever seen, and then some. The first thing you’ll notice here is that the front panel is nearly all screen, there’s very little bezelling going on. There’s a small black circle in the top right that hides the front camera, but no screen notch either. Other than that, this is a classic Galaxy design, with sleek edges and smooth curves. The build is glass and aluminium, giving real premium hand feel, as well as keeping the S10 Plus lightweight, despite its size. And the S10 Plus isn’t just about looks. There’s some amazing internals here, including a Dynamic AMOLED display, a triple lens rear cam, tons of storage and power, and plenty of nice little extras as well. The S10 Plus is one of the most expensive phones around, but you’re getting what you’re paying for. If you’re willing to make the investment then you’re going to have one of the best mobiles there is, bar none. Performance has to be the key set of specs that you’re interested in with any phone, and the S10 Plus has some unbelievable numbers here. There’s massive octo core processing, made up of a dual-core 2.73 GHz processor, a dual-core 2.31 GHz processor, and a quad-core 1.95 GHz processor. And there’s a solid 8 GB of RAM on the 128 GB and 512 GB versions or a huge 12 GB of RAM with the 1 TB version. All this means super fast speeds and great response to an input. As are all Galaxy phones, this is an Android device. You’ll run the latest Android 9.0 Pie right out of the box. This gives you more speed and security as well as stability since it’s the most recent Android version. But you also get some new features, like a brand new gesture navigation system, a brand new curved look, and plenty more. The performance here is excellent. There isn’t a phone around that’s faster than the S10 Plus. Whatever you need to do, the S10 Plus is capable of doing it and more. Fast, responsive, and top of the line, performance is absolutely faultless. We expect great displays from Samsung, and the S10 Plus doesn’t disappoint. You get a whopping 6.4 inches of screen space here, so the S10 Plus is a true phablet. Both typing and viewing are extremely comfortable. However, you won’t be using this phone with one hand, and the S10 Plus doesn’t exactly slide into your shirt pocket easily. In terms of resolution you’re getting full HD with 1440 x 3040 pixels, so around 522 PPI. That means a crisp, clear picture. Add to that the fact that this is a Samsung signature Dynamic AMOLED display with pure colour reproduction and great viewing angles, and you’re onto a winner. The display on the S10 Plus is a true pleasure to behold. It’s crisp, clear, with true blacks and bright whites. From HD video to simple web surfing, everything just looks better on the S10 Plus. If you love taking pictures, then the S10 Plus is going to be the phone for you. At the front, you’re seeing a dual lens camera (made up of a 10 MP, f/1.9, 26 mm lens and an 8 MP, f/2.2, 22 mm lens) perfect for selfies and video calling. At the back, there’s an amazing triple lens camera, perfect for even real pros. This a 12 MP, f/1.5-2.4, 26 mm lens; a 12 MP, f/2.4, 52 mm lens; and a 16 MP, f/2.2, 12 mm lens. Throw in LED flash, auto HDR, and all the other features that you’d expect to see on a top end phone camera and you’re set. Plus, Samsung’s camera software is intuitive and easy to use. You’re quite simply going to get amazing shots with the S10 Plus. Amateurs and pros alike will be amazed at the quality of pictures that the S10 Plus can take, making the camera set one of the best around. There are loads of extra features here and we can’t list all of them, but there are a few that are worth mentioning. First up, this is an IP 68 certified phone, so it’s waterproof (in depths of up to 1.5 metres for up to 30 minutes) and dustproof too. Secondly, if you’re observant you might notice that there’s no visible fingerprint sensor. This is because the fingerprint sensor is now hidden under the glass of the display. To unlock your phone you simply need to press your finger to the bottom half of the display. Battery life is always a concern with big screen phones. But the S10 Plus gets a huge 4100 mAh battery, which Samsung claim will last all day. And when that battery runs dry you have quick charge tech as well as wireless charging. The S10 Plus also features Wireless Power Share. This lets you place a wireless charging device (earbuds, a friend’s phone) on the back of your phone to charge, which is pretty convenient. There are tons of colours to choose from here, with the S10 Plus coming in black, white, blue, pink, green, and yellow. There’s a 128 GB and a 512 GB version, both with 8 GB of RAM, as well as a huge 1 TB version, which has 12 GB of RAM. These do come with microSD card slots though, so you can add up to 512 GB of extra storage. Right, on to the most important question, price. Since this is a Samsung Galaxy you’re likely to find it with any operator and at most major electronics stores. If you’re going SIM free then the S10 Plus is going to cost you around £899 for the 128 GB model, £1099 for the 512 GB model, and £1399 for the large 1 TB model. On contract, you’re looking at prices from about £45 a month plus £99 up front. With a phone as big (and fast) as this, you should really be looking for contracts that come with plenty of data included. And do a double check to make sure that you’re getting that faster 4G data included as well. If you’re generally connected to WiFi though, you might be able to get some savings by opting for a smaller data limit. Many networks are currently offering the S10 Plus with free Samsung wireless earbuds included, so you might want to look out for those deals. If you’re looking for discounts, then you’re not likely to find any anytime soon. The top end Galaxy phones generally don’t get discounted until the next model is due for release, which means you probably won’t see any savings until the beginning of 2020. If you wait until autumn you might be able to get deals on refurbished models. Alternatively, if the S10 Plus is out of your budget range it’s worth considering the slightly older S9 Plus model since you’ll definitely get savings there. The Samsung Galaxy S10 Plus is one of the biggest, fastest, and best phones around right now. It’s going to cost you a fair amount, but the specs here are just incredible. If you’re looking for the best Android phone that money can buy, then you’ll definitely need to check out the Galaxy S10 Plus. This is the phone that we’ve been waiting for. The massive Galaxy S10 Plus is a monster in more ways than one. A huge Dynamic AMOLED display? Yes please! What about a triple lens rear camera? Or a huge 1 TB of internal storage? There’s so much that we love about this phone that we couldn’t choose just one thing to love, we love all of it. And if you’re searching for the biggest and best phone around, then you’re going to love it too.